I’ve been following the creation of Joe Amaro’s Mystic Hammer for some time. Now it’s about ready to go, and thanks to Joe I have an in-hand sample of the final product to show off! 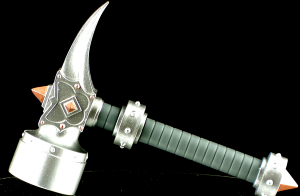 So join me for a look at the amazingly cool Mystic Hammer figure accessory created by the very talented Joe Amaro! Your reviews are awesome ! Only problem with this is; if I pick this up I’ll have to get TyTUs too. Man, i hope he made enough of these! I want one so bad. Anyone know what time this goes on sale btw? Finally, a cool weapon for Tytus!!!! I will definitely be buying one tomorrow!!!! That things is awesome! I'm definitely gonna have to get one! Looks ten times better than Tytus's Eternian Vacuum cleaner. Very good work on hammer by Joe Amaro. And very nice review by Dan. Tytus and Mystic Hammer purchased. Can’t wait to display them! This looks nice. I might grab one for my Tytus! Sold out! Glad I happened to check at the right time. One is on it's way to me. Arrrghhh! They were sold out by the time I woke up today! I'm hoping that he does another run! I'd really love to have one! Really Beautiful piece! Joe really knocked it outta the park with this! !